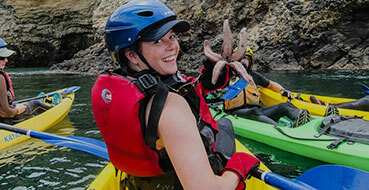 Looking to sport some Santa Barbara Adventure Company gear? We just launched our online gear shop with all the SBACo favorites, including our famous truckers hats! Online gift certificate are also available for those last minute gifts. Gift certificates can be purchased at all hours of the day or night and are valid on most trips, including Channel Islands kayaking, Wine Tours and Surf Lessons. Check out all our great new gear. Most of these items are also available to purchase with your guide on the date of your trip or you can call our office or order online. Visit our online shop and tell us what you think in the comment section below and we’ll enter you to win some gear of your own!